When winter’s gales lash the Fylde’s shores our lifeboatmen face anxious times – they must be alert and ready to put to sea in the most atrocious conditions if needed. Their commitment, dedication and courage is never in doubt. So imagine how lifeboatmen on the Isle of Man felt over 50 years ago when a Fleetwood trawler foundered on their shores – and they were unable to help! Circumstances surrounding the tragedy conspired to create a night of heroism, death and disaster. And an ironic twist of fate that sent 12 brave fishermen to their deaths had earlier seen the men feted and honoured for their bravery. But let’s go back to January 1940. The war was just a few months old and a new year was greeted with hope. At a special evening at the North Euston Hotel, the crew of the trawler Merisia were praised for saving Dutch seamen the previous October. They sailed next day for the fishing grounds – and perished when all were washed from their sinking ship in Bulgham Bay, near Ramsey, Isle of Man. A catalogue of circumstances faced the island’s lifeboatmen that night. Douglas lifeboat was out of commission due to an engine fault, Ramsey lifeboat was unable to launch because of the wind and sea conditions. Port St Mary’s boat did launch – but her lights failed and she carried out a fruitless search working in darkness. It was left to the gallant Ramsey Rocket and Lifesaving Brigade to try and effect a rescue from the cliff top overlooking Bulgham Bay. 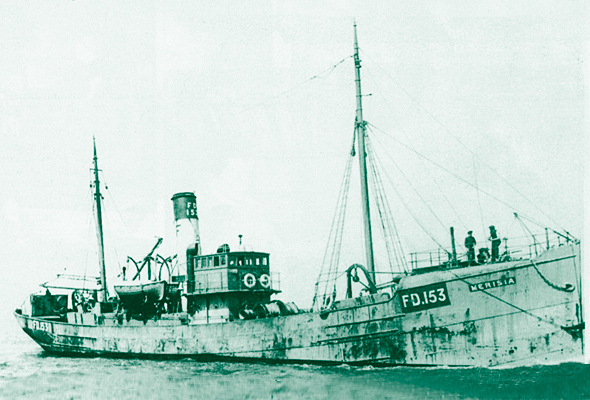 The Merisia had grounded on rocks and as the holed trawler filled with water the crew climbed into the rigging. Lines from the brigade failed to secure a lifeline and one by one the crew were washed into the icy waters. Some of the bodies were later recovered. A father, son and uncle were all lost. The 291-ton Merisia was owned by the Cevic Steam Fishing Company and the whole port of Fleetwood was stunned by the tragedy. In October 1939 Merisia’s crew had saved five Dutchmen adrift in an open boat in the Atlantic. The seamen had been in a small boat from the tanker Sliedrecht. When spotted by the trawlermen the seamen had been drifting for 8 days. They were too weak to move and at first it appeared they were beyond help. At the presentation evening Skipper Edgar Neave had received a pair of binoculars and a cheque from the owners of the tanker who also sent £100 to be divided among the crew. On board the Merisia when she sailed next day was Skipper Neave of Abercrombie Road; Mate George Neave, Elm Street; Bosun Thomas Harrison, Belmont Road; Deckhands Hector Neave, Elm Street, E Crellin, Radcliffe Road, C Mansell, Fishermens’ Mission, R Bennett, Beach Road; Cook J Fryer, Mowbray Road; Chief Engineer B Hearty, Shakespeare Road; Second Engineer J Millett, Church Street; Fireman J Montford, Fishermens’ Mission and W Hannon of Oswaldtwistle. Graphic reports of the loss of the Merisia appeared in the Ramsey Courier and Northern Advertiser when the editorial comment headed “Perils of the Sea” extended the sympathy of the Manx people to the bereaved. The writer went on: “Living as we do on an island girt by the sea, the horrors of shipwreck and the dangers of storm and tempest have a grim and terrible meaning for those whose daily lives bring them into such close contact with maritime life. “There have been many shipwrecks on the coast of the Isle of Man but few have been surrounded with circumstances so poignant as this, because the men who perished were so near safety and yet could not be saved. “The evidence given at the inquest showed that persons living in the vicinity had reached within 40 to 50 yards of the trawler and held conversations with the men who were facing death. Referring to criticism that Ramsey Lifeboat had not launched, the editor said the coxswain had given his considered opinion that it would have been endangering the lives of his crew to have put to sea in the conditions existing in Ramsey Bay at the time, and the coroner considered the decision a proper one in the circumstances. It was revealed at the inquest (on six bodies recovered) that on the fateful night the Douglas lifeboat was out of commission through engine failure and although the Port St Mary rescue-boat put to sea the crew were unable to locate the trawler. The coxswain said during the whole search the lifeboat had been in total darkness due to a lights failure. The weather had been very bad and the lifeboat was taking in a lot of water. They had been about half a mile from land as they searched the coastline. Ramsey’s coxswain told the inquest that it had been impossible to launch his lifeboat at any time that night due to the heavy seas and the very low ebb caused by the high tide. He said even if it had been possible to get off the beach safely, from his experience of the coast with submerged rocks and the bad visibility and heavy seas, it would not have been possible to get near enough to the Merisia to render any assistance. He said he had continually watched the seastate and weather throughout that night. At the inquest, Mr Alfred Hiscott told how he saw a vessel in distress after he alighted from the Manx Electric Railway near his home at Ballaragh. He went immediately to a nearby farm to raise the alarm. Accompanied by several men he then went to Bulgham Bay and on going down the cliffs onto the beach found the Merisia. Mr Hiscott said they shouted to the crew to float a rope to the shore but they didn’t do so. The tide was coming in and they, in consequence, had to leave the beach and climb up the rocks. The trawlermen were still shouting for help and the men waited on the cliff top for the arrival of the Ramsey Rocket Brigade. The rescue corps then spent over 6 hours attempting a rescue in horrendous conditions with a gale blowing and thick fog hampering visibility. Efforts to get a line to the trawler failed with the wind whipping the rope back to the cliffs. Men then clambered down the cliffs to continue their gallant attempts to reach the trawler. A coastguard working at the foot of the cliffs, was guided by voices from the trawler but all efforts to secure a rocket line failed. Their fight continued and a rocket was fired in the early hours when a man was seen on the mast. The line crossed the vessel between the masts and funnel but when tested was not secured and the fierce seas washed it back to the shore. At 2.30am the man on the mast was heard again but as the coastguard was preparing another line, the man disappeared. The would-be rescuers searched the area but at that time no bodies were recovered. In his summing up the coroner said everything possible in the circumstances had been done to effect a rescue of Merisia’s crew. He said men who went to sea followed a perilous calling and the hazards of war had added greatly to those perils. He added that on that Friday night the men faced a peril they had always faced – a raging gale – which had driven them onto the rocks. They were all sorry that 12 brave men had lost their lives in that way. The loss of the Merisia is also recalled in a history of the Ramsey Lifeboats (1829-1991) by Captain W N Seybold. In his book he reveals that it was on January 26th, 1940, in blizzard conditions that Merisia went ashore four miles south of Maughold Lighthouse. He outlines the rescue attempts by the Lifesaving Association and adds, “It had been impossible to launch Ramsey Lifeboat and the only one to put to sea was Port St Mary’s boat. “In terrible conditions the lifeboat came up the east coast and carried out a search for survivors. It is interesting to record that the Ramsey Lifeboat at that time was the Lady Harrison which had been on station on the island since 1931. She was the station’s first motorboat lifeboat. A self-righting type with a 36bhp engine, she was 35ft long. To supplement her engine power she was fitted with a main mast and mizzen and accompanying sail outfit. She was of timber construction with a solid canopy over the engine sited amidships. During her service until 1948 Lady Harrison launched 49 times, saving 93 lives. Her log recalls assisting several Fleetwood trawlers including Pasages (her first casualty in 1931); Velia (1932); and yachts Jubilee and Fanstona from Fleetwood. She also launched to give assistance in 1939 when the steamship Duke of Lancaster from Barrow was involved in a collision and also to help the Ulster Queen the following year which went aground with a crew of 53 and 93 passengers. Lady Harrison was accredited with saving some 60 lives on this rescue. The heartbreaking story of the Merisia and other stories involving Ramsey lifeboats can be read in Captain Seybold’s book.